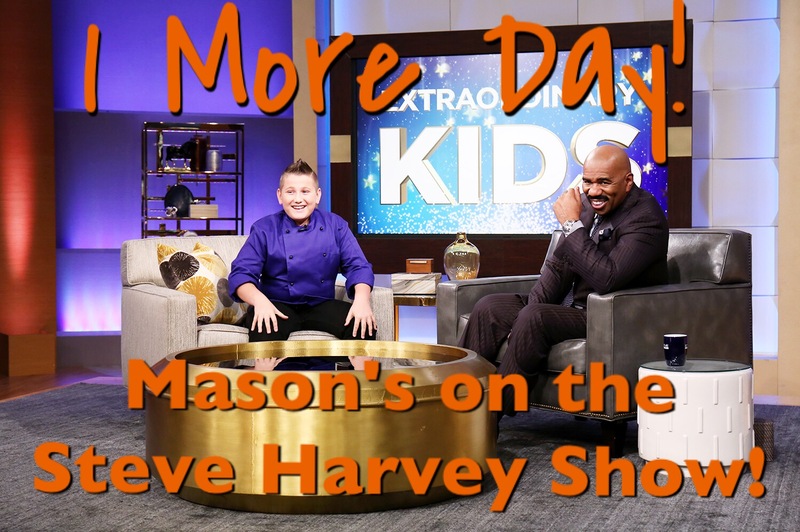 Tune in tomorrow to see Mason on The Steve Harvey Show. Did you hear the news? I was chosen to be KFBKs Hometown Hero for the month of May – WOW! If you know someone who is making a difference in their community, send KFBK a note and nominate them. I’m honored to have been picked. 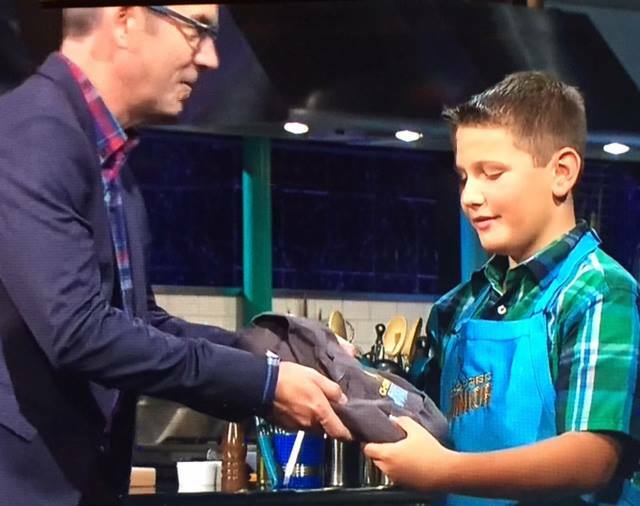 Meet Mason Partak, Winner of Chopped Junior! Meet Mason Partak! 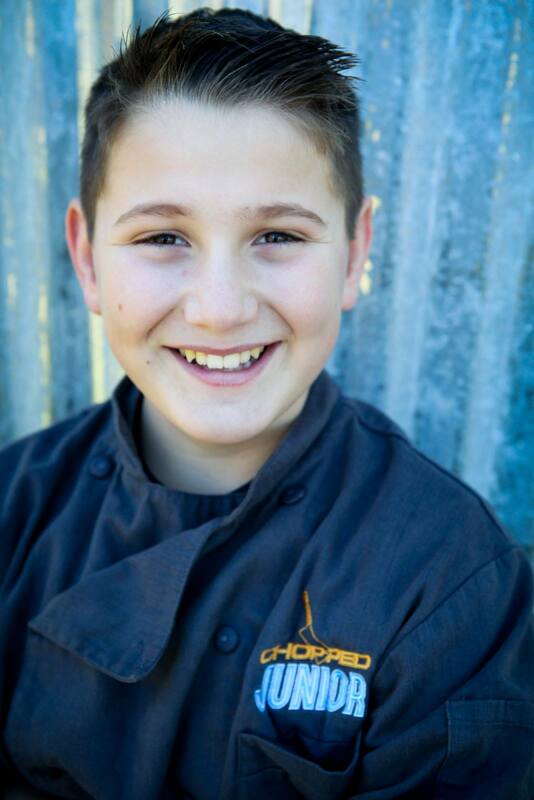 He’s a 12 year-old culinary mastermind from Auburn, California and a winner on Food Network’s Chopped Junior! You might have seen Mason on TV before doing cooking demos on Good Day Sacramento or in person at the California State Fair. 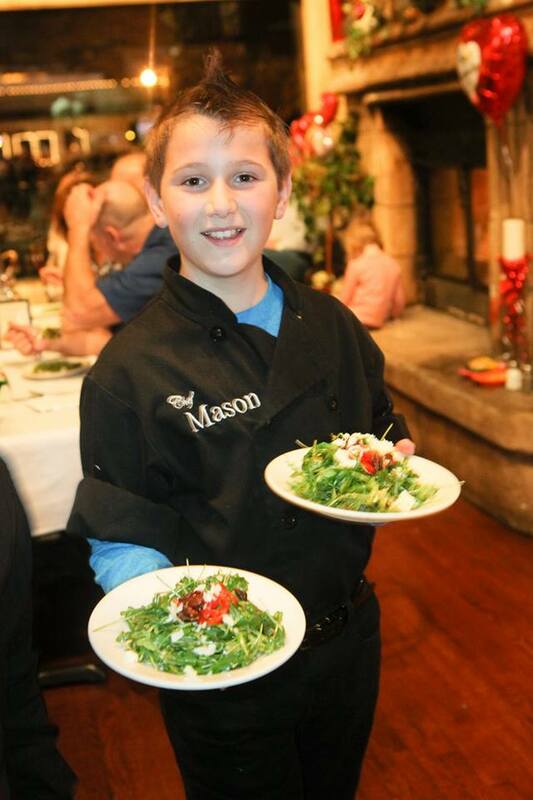 I have known about Mason and his cookery for a very long time, as I am friends with his mom, Kathy and have watched Mason grow up and mature into the bright, talented pre-teen he is now. Last month, Mason’s parents invited their friends (including me, YAY) to Pistol Pete’s for a viewing party the very first time the Chopped Junior episode that Mason appeared on aired. None of the guests knew what was going to happen, but we all showed up to see it on the several big screens in the bar. For me, I was just thrilled that someone I knew was going to be on a nationally televised program. I didn’t care win or lose, I was going to show up and support Mason. I would want the same kind of thing from my friends if I ever appeared on TV. I have appeared on local TV segments before and did a pretty good job, but remember being a ball of nerves. I can’t imagine having the chance to be on Chopped or how it felt. Cavegrrl: How did you get on Chopped and what is the audition process like? Mason Partak: I think I got selected to audition for Chopped Junior because I was the alternate for Rachel VS Guys season one. They cast 8 kids and I was their number 9. Food Network sent a culinary producer to my house and everything, so they knew who I was. I did have to do a Skype audition for CJ and it was my worst audition ever! I had a terrible day at school and I said crazy things, my mom was wondering who the heck I was?! When the call and email came that I had been cast, I was totally surprised. CG: What was the ingredient (in any of the baskets) that you were the most happy to see? MP: Totally the Wagyu skirt steak! I had already decided that if I got beef, I was making a taco and that is just what I did. It turned out that my spicy street taco was the best dish of the competition and Max’s in Auburn has it on their menu for the month of January. Above: Mason’s street taco dish. CG: What did you learn from being on the show? MP: I need to salt my food properly, which means a little more than I think I need. I also learned how much video gets shot and not shown when you make a show for TV. CG: When did you get started and find your love for cooking? MP: I’ve been in the kitchen with my mom and dad my whole life, they both cook. My mom let me help stir and mix cookies when she baked cookies and then she started to teach me to decorate them like she did in the bakery. When I was four, I wanted to chop things so she taught me how to properly use a knife. 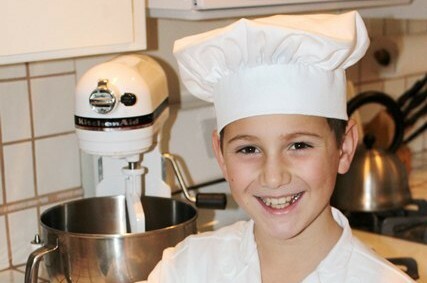 When I was eight, I was allowed to do my first live cooking demo and I loved it! I loved performing and cooking and I couldn’t wait to do it again. I loved that people liked watching me cook and teach them how to make recipes. CG: What is your fondest memory in the kitchen? MP: Baking sugar cookies with my mom. She has taught me how to decorate sugar cookies to look amazing and finally, I’m getting really good. We open the cookie factory right after Thanksgiving and decorate hundreds of gingerbread and sugar cookies for Christmas gifts. My dad makes different flavors of truffles and those are the Christmas gifts we give our friends and neighbors. CG: Do you have any favorite tools/appliances when cooking? MP: My chef knife. Kitchen tools and gadgets are fun and I love to ask, “What the heck is this thing for?” on my You Tube channel, but really, all I need is my sharp knife. CG: What is your signature dish and why? MP: I have several award winning recipes, but I love to make fried chicken. I have become very good at getting it just right, crisp on the outside, tender and juicy on the inside and I love to get creative with how I season it. It can be seasoned using a store bought seasoning packet or my own concoctions, no matter what, it’s always really good. CG: Please tell me about the company you have started, Mason Made. MP: Mason Made Products is a line of sauces, marinades and caramel. Asian Fusion, Organic Citrus Ginger, and my BACON Chipotle Barbecue are a few of the flavors that I love. You can marinate, use in conjunction with other seasonings and spices, and you can even use some of them with a bit of olive oil on salad. When I won Chopped Junior, I told my mom I thought it would be cool to start a business, the sauces are the start, but I am also working on a cook book and I am thinking about making copies of the learn to cook card game my mom created for me to practice cooking. CG: Any future appearances/plans in the works? MP: Right now, I’m excited about my spicy street taco being on Max’s menu (110 Grass Valley Hwy Auburn, California) for the month of January and my cooking demos in Auburn, Roseville, Sacramento, Napa, and Petaluma are already excited to have me back as a Chopped Junior Champion. I’m also working on a cream cheese recipe for cavegrrl.com. There is one other thing, but my mom said I can’t share yet, but as soon as I can, I will email you the details, sound good? Mason, yes! It all sounds incredible and I will be posting your recipe here sometime this week, as well as the recipe I made with Challenge cream cheese. I can’t wait to see what the future holds for you! PS: Alta Vista Community Charter School needs some help finding a sponsor or donations to buy groceries for the kids at the school to learn to cook. This is the same school that Mason helped raise $25,000 for a total kitchen remodel for the children to have access to proper culinary classes. Well, now they need the food with which to cook. Shallots, butter, olive oil, you name it. They need to raise $1,000 for the end of this school year and hopefully they can get a sponsor for next year. If you can help, email me at misscavegrrl at gmail.com and I will put you in touch with the right people! Remember, even five bucks can help a budding chef! Spicy Street Tacos on the Menu! 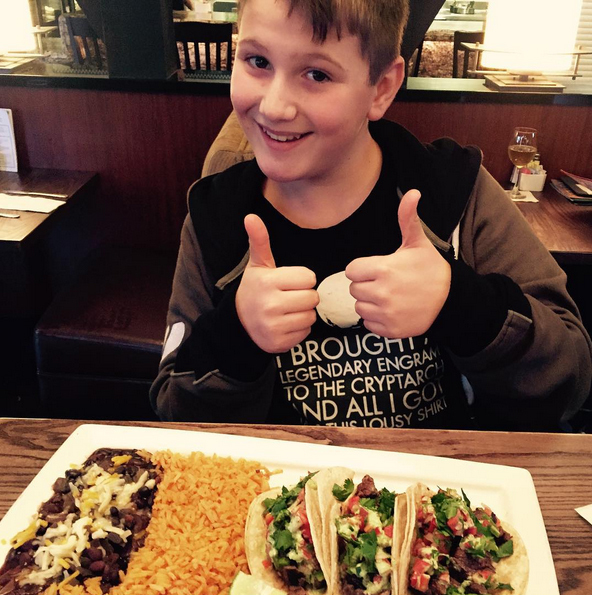 It’s true, Mason’s spicy street tacos that he created while competing on Chopped Junior are the featured recipe on the menu at Max’s in Auburn, CA. Mason worked to modify the recipe a bit so they don’t have squash blossoms or green strawberries in them, but they are to die for good! Who wants to have a dinner date and go with us?